Fentiman&#39;s tonic - is their reputation well deserved? Fentiman's tonic - is their reputation well deserved? I came across quite a lot of products. Many of those have a good reputation, however you should maybe not watch too closely. When it comes to tonic water, it seems that this game is at its best. There are the traditional products- 'traditionally' using a lot of artificial and highly processed stuff. Yes I look at you, Schweppes and Canadian Dry! And there is the 'artisan stuff' like Fevertree and Q-tonic. There are also the wannabes like Thomas Henry - which is really very much like the traditional stuff dressed in new cloths. Let's make not a secret out of it: the traditional stuff is not as bad (in taste) as most craft bartenders would like to see them. And the artisan stuff is not as good as everyone hopes. And the wannabes are... well not as good as the disappointing artisan stuff but definitely as good as the traditional stuff (but more expensive). But what is about Fentiman's? You can't make a joke about- The guys of Fentiman's have a great reputation. Yeah you can say, that they have the best reputation in the industry! Instead of making just conventional soda, they brew all their products - as I could extract out of a conversation with John Power, the new distributor in the UAE (now I've already blew the news - Fentiman's is now away label in the UAE) it is based on a ginger-bug ferment. Their products are definitely unique. 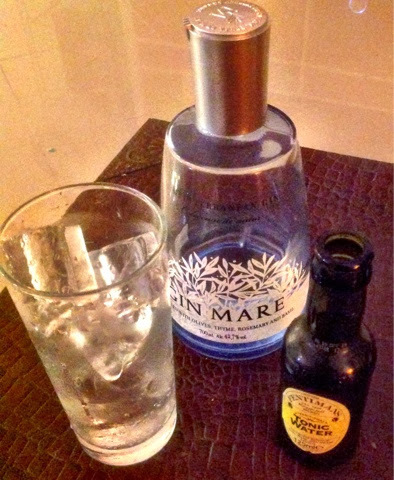 After a taste test neat and with Gin Mare I can say, that the tonic is unique - very unique. Without the gin, definitely the Kaffir lime leaf is sticking out. Other than some other products, it doesn't reveal easily, that it is fermented- I found it very clean and crisp. Given, that tonic water of different brands are pretty similar (be honest), it is without direct comparison the most unique product around. With gin, it highlights the botanicals - especially the resin'y and spicier botanicals (it is quite surprising, that while it has such a pronounced taste of kaffir, it doesn't over power citrus- but then, I haven't used lime or lemon in my tasting). It is really awesome. The G&T becomes more grown up, more complex - just more enjoyable. The bottle is a tiny 125 ml bottle. And here comes my criticism: while it might be a good measure for 30 ml of gin, it is too small for e.g. 45 ml (which should be the standard measure of G&T's). At more than AED 3 it is also not cheap. Is it worth it? Yes, definitely. But personal,y I would wish, that they keep the price and increase the bottle size to minimum 150 ml - even better 180 ml- this would be also enough for double shots! Back to Fentiman's tonic: what are your experiences with it?